In the 1970s urban renewal no longer appeared to be a solution to distressed cities. Instead of rejuvenating cities, it increased the destruction of downtown areas. Many city residents were bemoaning the loss of historic properties as urban areas were cleared often with little prospect that they would be rebuilt. A report coordinated by Lady Bird Johnson analyzed the effects of urban renewal. With Heritage So Rich, an accumulation of essays, called for “an expansive inventory of properties reflecting the nation’s heritage, a mechanism to protect those properties from unnecessary harm caused by federal activities, a program of financial incentives, and an independent federal preservation body to coordinate the actions of federal agencies affecting historic preservation.” The book triggered public awareness of the issue and offered a proposition to handle the situation through the National Historic Preservation Act of 1966 that included the creation of the National Register of Historic Places and the establishment of the Advisory Council on Historic Preservation and State Historic Preservation Offices. Cities like Lowell, Massachusetts and the state of Massachusetts looked to historic preservation as a means of revitalizing urban areas. Massachusetts initiated a state heritage area park program for cities like North Adams, Lawrence, Lowell and Lynn. It utilized the development of heritage area visitor centers to tell the stories of selected historic cities and started a buzz about heritage areas that spread beyond the state. Lowell came under the eye of the Federal government and initially used the rubric, urban cultural park, to establish a plan that integrated preservation, education, recreation and sustainable development. It ultimately was designated to be a National Historical Park and continues to have an active presence of the National Park Service. Heritage areas came on to the scene in New York State in 1977 also under the name urban cultural parks. Urban cultural park was a tough name for the public to grasp especially for a notion of park that could encompass whole cities or regions. Even the more than century old Adirondack Park without an entrance gate and with a bit more than half its territory being in private ownership was called a “park in the painful process of becoming a park” on its centenary in 1992. So, to call the neighboring communities of Troy, Cohoes, village and town of Waterford, Watervliet and Green Island an urban cultural park was a stretch. Yet, it was a stretch that offered hope of the emergence of a new generation of park types. In 1976 the young, newly elected Mayor of Cohoes (now retired Majority Leader of the NYS Assembly) bought into the notion of urban cultural parks as a way to capitalize on the heritage resources of multiple neighboring historic communities. This Mayor Ron Canestrari organized his neighboring mayors and supervisors to designate their collective communities the Hudson Mohawk Urban Cultural Park (HMUCP) and establish an inter-municipal commission to realize a vision of communities capitalizing on their 19th century industrial heritage. Knickerbocker News editorial editor Duane LeFleche got the idea including an appreciation for the name. It was simple, wrote Duane in an editorial. Take the name urban cultural park apart and you have urban meaning a settled area, culture meaning human attainments (more than the arts) and park meaning there is coherence to the settled area including a shared story of the attainments of its residents over time. The coherence of the HMUCP was the shared story of the industrialization of America including iron and cotton in the 19th century. Some state legislators also got it and in the 1977 legislative session state legislators like Assemblyman EC Sullivan from Manhattan and Senator Joseph Bruno from Troy introduced two pieces of legislation. One simply designated the HMUCP as a state urban cultural park and directed the state to plan a heritage trail to connect its industrial landmarks and assets. The other took the notion of a city or region as a park and directed the State Parks agency to prepare a plan for a statewide system of urban cultural parks. It was intended to promote preservation, education, recreation and economic development simultaneously through state-local and public-private partnerships. At the time, a planning effort was going on in Lowell, Massachusetts to develop a plan for Lowell to become a national urban cultural park. (It ended up as the Lowell National Historical Park within the National Park System.) Assemblyman Sullivan liked the idea but wondered how you could have a “park” when; for example, the urban cultural park community of Waterford had a McDonalds in it. The executives in the state park agency were not happy about the urban cultural park legislation. A Deputy Commissioner told me this was only a back door way for distressed communities to get the state to pick up basic municipal costs. For state park officials parks were public estates, some with scenic beauty and others with golf courses, swimming pools and campgrounds. Unlike The New Yorker magazine that did a “Talk of the Town” on the NY Harbor urban cultural park, they could not see how the conditions traditionally associated with parks could be found in urban settings. They much preferred going out and about the state visiting state parks and taking their golf clubs. Those in the State Parks Agency were perplexed. They didn’t know which of the two urban cultural parks was worst for them from their narrow perspective. If the HMUCP bill passed, they feared it would become the care taker for distressed cities. Yet, the thought of a statewide system of urban cultural parks might be even a greater threat to their peace of mind and golf outings. At one point during the legislative session a group of State Park Executives including Fred Rath, Deputy Commissioner for Historic Preservation, asked to meet with the legislators sponsoring the urban cultural park bills. Meet they did. Mr. Rath started the conversation by almost poetically saying the urban cultural park notion would be the highest realization of the historic preservation ideal. It would go beyond individual features and even historic districts and encompass the entire narrative of communities and regions. The legislators were impressed. They had hit upon something more significant than they ever imagined. But then Mr. Rath lowered the boom by declaring there was absolutely no way the state parks agency would be able to administer a program of the magnitude of urban cultural parks. Yes, Deputy Commissioner Al Caccese affirmed that is so. It was too late for the state parks leadership. The cat was out of the bag and there was no way the legislators would be deterred from passing the urban cultural park legislation after hearing Rath extol the urban cultural park idea. Both urban cultural park bills were passed by the legislature and signed into law by Governor Hugh Carey. The state parks agency never had much enthusiasm for urban cultural parks, but doing nothing was not an option. It hired Lane and Frenchman consultants who worked on the City of Lowell urban cultural park and were able to generate interest in many communities in New York. Outreach to communities across the state from New York City to villages like Sackets Harbor along Lake Ontario and a pilot grant program led to 13 communities doing feasibility studies on their qualifications to become part of a statewide urban cultural park system. A plan for the UCP System was published. Implementing legislation led in large part to enthusiasm of state legislators like Assemblymen Sullivan, Maurice Hinchey and Oliver Koppell was enacted in 1982 and 13 communities including the HMUCP went through the arduous process of preparing their management plans that the state park agency adopted. A driver for the UCPs came in 1986 when Assembly Hinchey got $20 million dollars in the a state environmental quality bond act to be used to pay 100% of the cost of visitor centers in each of the then 14 UCPs. On the national scene, regional national heritage areas took off in the 1980s. They were established on the basis of individual Congressional legislation and were under the wing of the National Park Service. But they were at best treated as orphans and not fully accepted into the National Park System. 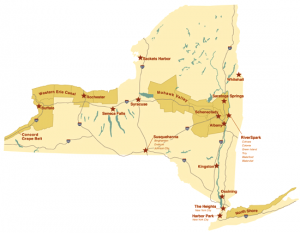 The National Park System and the NYS parks agency had something in common in their arms length approach to heritage areas. Yet, one can say that National Heritage Areas thrived, there being 49 National Heritage Areas, which includes 4 in New York State. The leadership of the state parks agency was never happy with urban cultural parks aka heritage areas and 33 years later with the state having a comprehensive urban cultural park aka heritage area law on the books, 20 state designated heritage areas and 4 National Heritage Areas in existence, the state parks’ executives including the retired Spitzer appointed Commissioner Carol Ash and her successor Acting Commissioner Andy Beers washed their hands of heritage areas without consulting with their state and local heritage area partners or the state legislature. Their excuse was that they couldn’t afford to participate, even though participation was essentially only the part time services of two state employees. State-local partnership was never appreciated by the State Parks agency. Perhaps in their indifferent approach to heritage areas and a new type of park lies a reason the traditional state park system is so ripe for being picked apart during a recession like the recent one by the Executive branch. Letter from Woodstock: The Presidio Matters » « NHA@30: Funding for NHAs – Past and Present and What About the Future?